In a world where individuality is “king” the term accountability is seen as an assault to our ego-centric ways. It tends to be a word that we shy away from, even in Christian circles. I recall attending a retreat where we were defining what Biblical Discipleship is and one of the key truths that were brought out was none other than accountability in that we need others to keep us accountable. This was somewhat “controversial” because many in the group did not like the term or it made them uncomfortable to say the least. I would submit that it all goes back to our cultures and how we perceive the “outlandish” idea that we’re responsible for or actions and accountable to others! It would seem that no one in the natural man really likes to be held to a standard but as you grow as a believer you begin to see that the Bible, God’s Word, teaches that accountability is important. 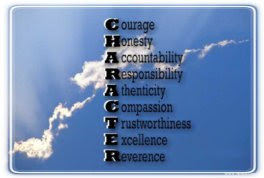 Furthermore, the character qualities of accountability and responsibility really go hand in hand. Whether we like it or not we are held accountable for our actions even though sometimes we might question this as we witness other people not being held accountable and essentially getting away with ridiculous actions. Regardless of other people’s actions, we should always seek to do what is right in God’s sight. Let’s say you’re going 55 MPH in a speed zone where the posted speed limit is 25 MPH? If a police officer sees you, (of course you’ve broken the law no matter if they see you or not) and with lights flashing and siren blaring they pull you over, you will surely be given a ticket. Now the culture might say, “You can’t tell me how to drive!”, “you don’t have a right!” The reality is that there is a standard no matter how the culture tries to deny it or place blame on someone else for their own individual actions. Now, you may think this is ridiculous but our society seemingly has devalued personal responsibility as it’s hardly emphasized anymore. You needn’t look any further for evidence of this than the news with reports of lawsuits over outrages things. More often than not, the person suing a company or individual is really the one at fault but they don’t want to be accountable for their actions. Of course in the before mentioned example - the right thing to do would have been to not speed in the first place, but in the “off chance” that you were the one speeding or have ever been in a situation like this, you should own up to it because you are responsible for your actions. God’s standards are higher than ours and fight it as you may - His way is better than ours and allows you to really have a more successful life for Him especially when you live by His standards and reflect His character qualities. As previously mentioned, a key to discipleship is accountability with other believer’s. If you don’t have accountability then you become like an island, you stand alone and you don’t have anyone to act like a jetty or barrier reef to protect you from the waves that come crashing upon you. No one was designed to travel this journey alone and God brings others into our lives to make us better people to make us more useful to Him and more mature. Accountability and responsibility is important in all areas of your life not only for spiritual reason but also for very practical reasons as well. Let’s consider for a moment a real life example. Let’s say that your employer gives you a task to complete and you blow it off or maybe you respond with a very negative attitude? How do you think your employer will respond? Well, you will be held accountable because you were responsible for completing this task and if you could not complete it you’d be expected to communicate this and work with the stakeholders to adjust the due date. If you’re reading this and you’re self employed, you likewise are accountable but in your case it’s directly to your customers as you’re responsible for fulfilling your agreement with them. Likewise if you’re a student and reading this, you’re accountable to your teachers or professors as you’re responsible to complete your assignment or projects and you’re responsible to be engaged and attentive in class. If you choose to not do these things, you’re grades will reflect this. There numerous examples we could discuss here but I’m sure you see the point here. Ultimately we’re responsible to live our lives in a way that will bring honor and glory to God. You are and will be accountable to God and when you enter into eternity with Him He will assess what you did or didn’t do with your life. Hopefully this doesn’t make your fearful rather, hopefully this truth with help you understand how you should be living your life and allowing the Holy Spirit to help you make necessary changes. We are accountable to God and other Christians and we need to embrace that and allow God to work this in our lives for our good and for His glory. Make your life matter for something more than your own personal - temporal gratification. Be a living example of God’s character. Live your life being accountable to God and others and actively be responsible for your actions whether exemplarily or when you stumble because it’s not only the here-and-now but it’s also eternity that matters. Questions to Get Started With:-What do you think God’s assessment of you will be on your way into heaven? -Who are accountable to and who are you or what are you responsible for? -What changes do you need to make to be more accountable and responsible? -Do you have an addiction you need to be accountable to someone else about? -Do you have an important goal you’ve set but you’ve yet to achieve? Do you think having someone check on your progress once in a while might help you? -Do you purpose to stand up and be accountable and responsible for your actions – no matter the consequences? -Have you been running from something you did possibly years ago? Don’t you think it’s finally time to confess it to God and be responsible for what you did? Again, no matter the consequences? -What about how you’re living now? Anything you need to confess or be accountable for? -According to Romans 12, how should we be living our lives and interact with others, especially other believer’s? -In addition, what does Matthew 5:13 say about how we should live or be characterized? -What or who are you living for? For Further Study:1-Do a Bible study on accountability / responsibility. 3-Pray and ask God to help you be accountable and also help you build at least one relationship (If you’re man, with another man or if you’re a woman, with another woman) to the point where you can be accountable to each other so you can speak into each others lives because you’ve come to trust each other.